Fleet decision-makers are being urged to use newly-released real world fuel economy figures for total cost of ownership calculations. 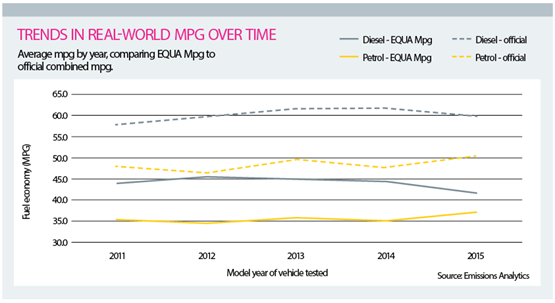 The new EQUA Mpg Index, launched by Emissions Analytics, provides fuel economy data for more than 60,000 model variants, based on actual on-the-road testing. It has found that the average shortfall between official and real-world fuel economy results has reached 29%, with some vehicles more than 40% adrift. More than half (51.1%) of respondents to a Fleet News poll said they were suffering an average shortfall on official fuel economy figures of more than 20%, with one in 10 not even managing to achieve half the advertised mpg. Just one in 20 (5.1%) said that they were managing to get within 5% of official fuel economy figures, with a third (32.3%) of respondents falling short by between 11-20%. Fleets can look forward to more accurate fuel economy figures from September 2017, when the World Harmonised Light Duty Test Protocol (WLTP) will replace the much-maligned New European Driving Cycle (NEDC) as the type approval test for cars in Europe. It will contain higher speeds and accelerations than the NEDC, better reflecting real driving. However, the fuel economy test remains entirely in the laboratory, and does not expose the car to normal traffic flows and on road gradients. As a fixed cycle, it will also be susceptible to manufacturers optimising their vehicles to this test, says Emissions Analytics. While an improvement, the WLTP will only partially close the current gap between official data and reality. Emissions Analytics expects the new testing regime will reduce it by about half, meaning a 10-15% gap will still exist. However, ahead of the new testing regime being introduced, the PSA Group has issued real-world consumption figures for a range of models. The real-world test procedure was conducted with Transport and Environment, France Nature Environment and Bureau Veritas, and based on the new WLTP test. It showed discrepancies of between 30% and 40% against the official combined figures on the Peugeot 308 and 2008, Citroën C4 Grand Picasso and DS3 powered by an 118hp 1.6-litre Blue HDi diesel. But, when its ‘real world’ lab results were compared to data from Emissions Analytics on-the-road testing regime, the shortfall was actually very similar, suggesting the WLTP will be fairly accurate. To enable a fair comparison between different models, Emissions Analytics uses a standard, proprietary test route. The route covers a mix of urban, rural and motorway driving, designed to reflect typical – rather than extreme – driving styles. Each car is tested in the same way, by the same team of drivers within a consistent range of climatic conditions, and Emissions Analytics says all tests are checked for data quality and consistency, to ensure the EQUA Index is a fair reflection of performance. It uses a Portable Emissions Measurement System – a high-grade on-board gas analyser that measures to a high degree of precision, second-by-second, what comes out of the exhaust. Not all 60,000-plus cars have been tested by the company however. Around 1,200 cars have been put through their paces across a range of makes, models, fuels, engine sizes and model years. This enables it to understand the typical effect on mpg of each individual element and forecast what the fuel economy will be for a model it has not yet tested. In the published results, actual tests (with the higher degree of accuracy) are clearly distinct from these forecasts.